Stephen and Owen King: A Literary Power To The Nth Degree. GREAT!! YESSIREE BOB! 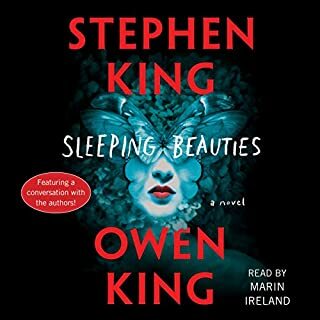 Waiting for the audible release of Sleeping Beauties was agonizing. It was like waiting to open the best ever of Christmas gifts. My lifetime of vision problems prevented me from reading Sleeping Beauties, so I waited. both women and men is crucial for a listener to begin the wonderous adventure that is “Sleeping Beauties” . At first a simple premise: What would happen if all the women of the world feel asleep? What would men do? and How would they react? How would they live in a world without women, wives, and daughters? The answer is not so simple. Eve Black is the one character that needed special concentration. She is not a typical King character. She is no pennywise or nos4ratue. But, she is a deep convoluted women who tries, despite her own misgivings, to represent. And her strength comes through when she must allow the women of Durring to make a decision free of coercion. The psychological force of “Sleeping Beauties” is what keeps the listener moving through the story. You are always wondering, What will Clint do to protect Eve and those very important inmates of the women’s prison? What will the women decide? Sleeping Beauties starts by asking one simple question but, the answers are what helps the novel flow and in my very humble opinion stand way out. I loved just like I hoped. The psychological side of these two authors offer up one great audible time. THANKS MUCHLY to both King Sr and King Jr. for a great ride. This was a great, feel good novel. 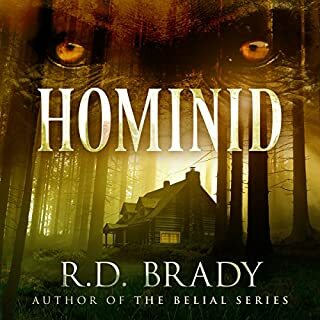 The writing was smooth and the characters so likeable that you couldn't help but be caught up in their quest to save the ever mysterious Bigfoot. The narration was excellent and helped make this story one you just had to smile at after it was over. 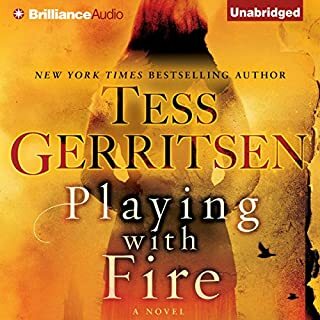 "PLAYING WITH FIRE" is GERRITSEN'S BEST EVER!!! What did you love best about Playing with Fire? "PLAYING WITH FIRE" was a striking testament about WWII, Italy, and lives so brutally taken by nazi concentration camps. One must never forget, despite seventy years passed, that everyone of them carried a personal story woven into their souls. Each different and distinct. And when it comes to the soul, we are all equal. Grab some Kleenex and listen closely because TESS GERRITSEN has written an absolutely beautiful book, one of her finest pieces ever. Don't even think of passing it by. THANK YOU MUCHLY! One last test. One last quest. Adrian and the men and women who love him head deep into the city in search of the one thing that may save Adrian's soul, and the entire world. Redemption. But before he earns what he needs so desperately, there will be blood, and there will be death. 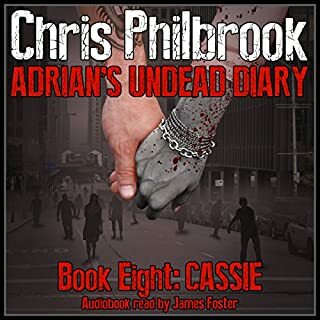 This entire series.These 8 deliciously wonderful and undeniably brilliant undead diary books were/are/forever shall be, the absolute best series I have ever laid ears on. I apologize for the bad pun but, I'm visually impaired and I just couldn't resist. Anywho, if you have read the entire series that's great but, these books scream out to be listen too. Why is that you say? Well, (heavy sigh) Chris Philbrook and by extension the narrator James (what a performance) Foster fit together like a hand and glove. The character development is serious, seamless and deep. On occasion I cried a wee tear or twelve, laughed harder than I thought possible, and I even puzzled (sometimes out loud) with various characters when the tough or delicate questions were asked. The story development did not falter from one book to the next. I love these books and will always have them primed and ready to listen to them again and again. So a big shout out to Chris Philbrook for writing and developing this most awesome series. And another goes out to James Foster for bringing these most awesome books to life. So Audible members give these books a listen. You will never be disappointed. 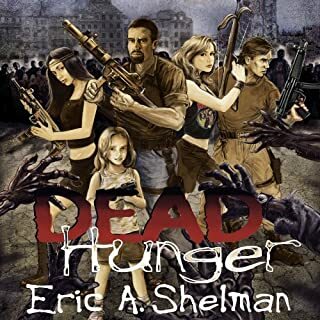 A phone call to his sister leads Flex Sheridan into a nightmare and a quest to save his family from a new, horrifying epidemic that's turning humans into zombies. As he makes his way from Georgia to Gainesville, Florida and back, he picks up old and new friends and survivors. Flex re-connects with perhaps the strongest woman he's ever known, Gem Cardoza, his former girlfriend. Zombie 101!. Characters who learn as they go! A book that begins with a rag tag quasi-team of nobody's that has to educate themselves about everything Zombie. Including, that universal piece of knowledge, head shots are the only thing that puts them out of their misery for ever!!! INTERESTING. The entire human race balances on the razor's edge of annihilation, beset by an enemy that turns our own bodies against us, that changes normal people into psychopaths or transforms them into nightmares. To some, Doctor Margaret Montoya is a hero-a brilliant scientist who saved the human race from an alien intelligence determined to exterminate all of humanity. To others, she's a monster - a mass murderer single-handedly responsible for the worst atrocity ever to take place on American soil. All Margaret knows is that she's broken. The blood of a million deaths is on her hands. What did you love best about Pandemic? I loved absolutely everything. What a fantastic piece of work. This book follows the two previous novels that had us all quietly promising ourselves that blue triangles and the odd but suddenly appearing thread stuck to our elbow or foot is for a nanosecond not going to kill us. "PANDEMIC" by Scott Sigler is one of the most intricately, deep, and superbly written novels I have listened too in a very very long time. Character development was superb, deep and absolutely mesmerizing. What you think at the beginning of the book changes, surprises, infuriates and terrifies you as we learn more and more about each character, whether old and familiar or new and unfamiliar. The story becomes more intricate, and has some of the best unexpected twists and turns I've experienced in a book in a very long time. And I loved everyone of them. This novel is long. Some may say too long. But for the story to unfold and truly and accurately tell the "PANDEMIC" story so grippingly, the length is an absolute necessity. What other book might you compare Pandemic to and why? There is only one book that ever gave me this kind of a literary ride. "PANDEMIC"by Scott Sigler, for me, can only be compared to "THE STAND" by Stephen King. And believe me it does more than hold it's own in such a comparison. This novel is a journey that scoopes you up and takes you on a terrific, and at many a time, a terrifying literary ride. Simply, this novel was a great surprise. 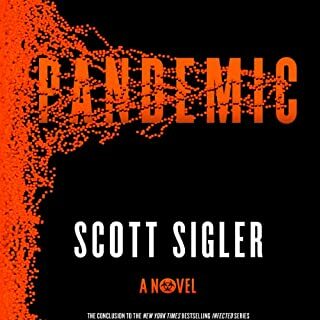 Hang on, be patient, and let one of the best narrators in business, Phil Gigante, bring Scott Sigler's "PANDEMIC" to literary life. And when your done you'll be hiding your child's blue crayons, paint, markers and coloured pencils until he or she graduates from high school. It' a great ride that you won't soon forget so ENJOY!!! THE ROCK HOLE, AN ABSOLUTE GEM! DO NOT PASS IT BY! What made the experience of listening to The Rock Hole the most enjoyable? This novel is like a time machine. Taking the listener back to the early sixties, clearly an important and loving time for the author. Yes, it is a work of fiction but, Reavis Wortham wrote a novel that is so delousicly descriptive and a absolute delight to listen too that it's virtually impossible to turn off. The Rock Hole is, in my opinion, one of the best novels I've listen too in a very long time. An absolutely superb narrator only adds to the enjoyment of this novel. Told from the perspective of both an innocent 10 year old child and through the wise old eyes of his seventy year old grandfather/guardian, I felt like I was bringing transported back in time. I laughed , and shed a tear or two for both T.O.P, the young boys nickname and for Mr Ned his grandfather. This novel wraps you up and takes you along on a simple and a fantastic journey to the old south. Wortham is so delightfully descriptive within the pages of The Rock Hole that you half expect to find a stray strand of hay struck somewhere in your hair and the smell of manure wafting past your nose. This is an absolute diamond. I finished listening to it in one day. I was even disappointed when I had to temporarily pause my listening so I could have my evening meal with my small family. 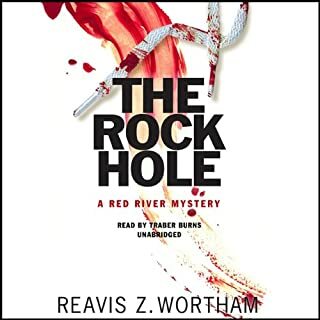 LISTEN to THE ROCK HOLE by REAVIS Z. WORTHAM. It is truely a terrific find. I'm sure you'll love it as much as I did. SIMPLY WONDERFUL. The innocences of TOP wins you over and draws you deep into his world as a ten year old moving from the city to the real country. You follow along absorbing his grandfathers advice like you were one of the many wonderful charecters in this novel. However, I know that I'll never hunt quail, shoot wild boar or even come close to a real working farm but, for one split second, as I listened, I thought I just might be able too. That's how good this novel is. THANK MR WORTHAM for writing such a terrific story and THANK YOU MR TRABER BURNS for bringing this story to life. I just can't say enough. THANKS AGAIN!! DOGS, A CAT AND ZOMBIES. WHAT ELSE COULD YOU WANT? Where does The Book of Riley rank among all the audiobooks you’ve listened to so far? 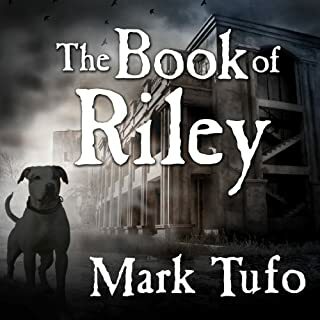 The Book of Riley and it's creator Mark Tufo are in a category all of their own. I have read,or should I say listened to, everything Mr. Tufo has written and he never fails to surprise, but most of all, he never fails to make me laugh. Yes I have a bit of a sick sense of humor but, when you think about things really if you don't laugh your life is a lot darker.I believe my cats (as much as they are maligned in other's worlds hint hint) are intelligent and probably would talk too if I should write a series of stories imagining them rescuing their humans from a sudden zombie apocyliptic world ending horror. To put it easy The Book of Riley 1 and The Book of Riley 2 are entertainment in it's purest form. Mark Tufo is a brilliant author with an imagination and a wild sense of humor. Look him up, and simply ENJOY. Cats can count higher than dogs. YEAH!!! !Laughed out loud when Santa had to kill those weird end of the world believing neighbors. Which character – as performed by Sean Runnette – was your favorite? Patches, the cat, of course. Although I have to laugh whenever the subject of dogs and bacon comes up. Also, Santa will never be the same now that I have heard him described through BenBen's eyes. I was moved to tears of laughter when two dogs, one cat, and an infant found out they could all talk to each other. After "TWO GRAVES" You'll Never Garden Again EVER! Would you listen to Two Graves again? Why? 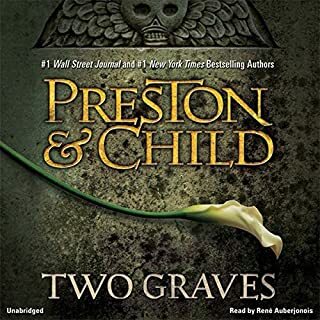 "Two Graves" by Preston and Child is a wonderfully wicked novel that will leave any listener far from any digging utensils for quite some time. This long novel takes the listener on a mystery rollercoaster ride that will leave many fans looking at their garage or any neighbor carrying a gardening shovel in a entirely different way. Because charecter development is so deep, and Pendergasts' F.B.I. and personal veneer cracks so unexpectantly, any listener would have to be insane not to delight in, what I think is, P&C's, best novel of their careers. I would definitely listen to it again, especially because of the superb and wickedly delightful narration of Rene Auberjonois. He plays a huge part in this books success. He definitely brings this story to life.This new novel is so incredably complex that any P&C fan may need to listen to it more than once, if only to truly enjoy every delightful twist and turn. It is so thoroughly constructed that, despite the book's length, any new or old Preston and Child fan will delight in this convoluted and thought provoking mystery. It is so good that listening to the novel only once may not be enough for any fan. It is truly a wickedly delightful literary ride that many will remember for a very long time. A great listen. A series of horrifying events occur in quick succession in the same upscale L.A. neighborhood. A backyard renovation unearths an infant's body, buried 60 years ago. And soon thereafter in a nearby park, another disturbingly bizarre discovery is made not far from the body of a young woman shot in the head. Helping LAPD homicide detective Milo Sturgis to link these eerie incidents is brilliant psychologist Alex Delaware. But even the good doctor's vast experience with matters both clinical and criminal might not be enough. Kellerman does not disappoint. Another great read. ALEX DELAWARE LIVES! BUT MILO HAS BECOME A GHOST! 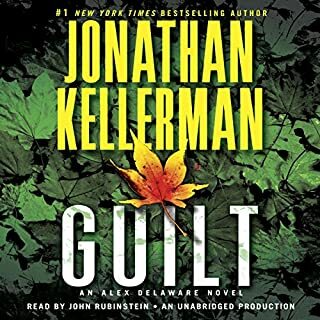 Kellerman's "GUILT" is one of his better psychological thrillers to date. But not his best. This new Kellerman Novel relies heavily on Alex Delaware's quirky and methodical way that he gathers the smallest of clues and slowly, sometimes achingly so, pieces them together to solve the multiple murder case. It is true that this book can be annoyingly slow at times, but that is mostly because we, the reader, spend a great deal of our time tumbling through Alex Delaware's grey matter. Kellerman's Novel "VICTIMS" was slightly better book because it was faster paced. But Kellerman has brought a more complex Alex Delaware character to light in his new book "GUILT" Hopefully he continues to expand Alex's participation in solving more murder mysteries. However, the expansion of the Delaware character, and the flow of the story, should not be at the expense of the Milo Sturgess charecter. The Milo charecter seemed stunted and dull in this new novel. And because of this the pace of the story slows. I love to see Delaware helping the police as much as I love to see him in his true therapist/client role. There is a place, a determined place, for each. A delicate balance of the Delaware/Sturgess characters and a set of murder mysteries must be struck for Kellerman books to be truly great and thus earn the five stars available. "GUILT" is still a great listen, and I'm glad I spent the money to buy it. It's just that Kellerman has to balance and combine his two main characters and the bones of a good murder mystery a wee bit better in order to deserve that fifth star.